Belle vom Orakel and her litter-brother, Black vom Orakel, both passed the Körung 'for life' with highest rating for hardness and working drives. Their sire, Yago von Ellendonk, and dam, Zastra von Ellendonk, also both passed the Körung 'for life' with highest rating for hardness and working drives. Belle lived to 9 years of age while her sire lived to 8 years of age and her dam lived to 6 years of age. David: SchH 3, FH and passed the Körung 'for life' with V 1A rating. 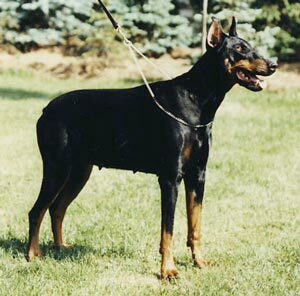 He is sire of the von der Weyermühle “C” litter and vom Kiepenkerl “A” litter (Askan).